Arh-woooooooo! That’s the cry of the lone wolf breaking from the pack, ready to take on all that challenge. Apex Legends is a team game at its heart but certain circumstances may not always put you in the best starting position. Be that due to disconnection, early deaths or simply wanting to prove to the world that you have what it takes to go it alone. That’s where we come in. Whenever this unfortunate situation rears its head or the daredevil within you takes hold, you’ll want to have the best tactics prepared for the oncoming storm. Let’s take a look at what choices, strategies and more can be done to optimize single survival. 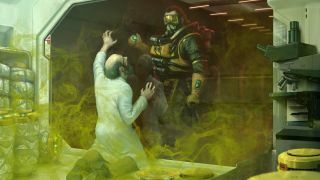 Respawn has given Apex a wide variety of characters, each with their own distinctive personality and set of skills, therefore some are better equipped for solo play. Bangalore for instance is setup better than most, with her Smoke Launcher ideal for taking down a full squad while her Double Time ability increases her sprint speed whenever under fire. To top it off her Ultimate, Rolling Thunder, can decimate the surrounding area. Moving on, we have the mad scientist Caustic who is perfectly adept for setting up camp and waiting for enemies to stumble on in. His Nox Gas Trap places six cannisters while his Nox vision gives the madman sight of anyone caught in the poisonous fumes. Even when totally out of luck, his Ultimate will blanket the area in gas allowing for the killing blow. The third and final recommendation from characters currently available, is the mysterious Bloodhound. At the time of writing Bloodhound is the only tracker in Apex with specials unlike no other. Eye of the Allfather is the most reliable, allowing users to locate both enemy footsteps and traps. Finally, Beast of the Hunt grants heightened speed as well as raising your senses - ideal for pulling out all the stops. Sometimes bigger is better. Apex has two shotguns (of note) worth discussing: Eva-8 Auto and Peacekeeper. The latter of which is ranked with the best weapons in the game. Working in close proximity, shotguns can take down rivals in the blink of an eye giving out maximum damage. The alternative approach is by keeping your distance by utilizing a sniper before challengers get too close. However, the downside to this is that the battle royale system does not work in it favor with circle constantly pushing players nearer to one another. In other words, a backup is always needed. Kings Canyon has a great number of different regions to survey. Depending on your strengths, it’s better to set up shop and play the long game. This may come across as dull for some and might not factor into user playstyles, however waiting for opponents to whittle one another down will significantly increase your chances of coming out on top. Breathe. Wait for the right moment to strike to make the most impact, then retreat when necessary. Being out in the open is exactly what you don’t want as a solo player. Thankfully Kings Canyon has buildings spread out far and wide making getting shelter not the most difficult of tasks. Stick to these structures where possible - prioritizing high ground. This limits opportunities for your character to be spotted and consequently taken out. Think about this when originally descending at the beginning of the round. Taking a few seconds to analyze the map and plot your next course of action can save a world of hurt too. Like Titanfall, Apex has a great number of mechanics that switch general play up drastically. With constantly changing environments, the slide feature brings tremendous speed helping to escape any unwarranted situation, besides giving an edge when committing to a surprise attack. The other interesting aspect is being able to climb everything. Make use of this factor to either loop round on enemies or drop down from above. Time is of the essence and without any backup you can’t afford to execute a Finisher. These moves may look cool but they take far too long leaving you vulnerable for an extended duration. Only consider using one if you have legendary armor which restores your shield to full capacity. Positioning near a Respawn Beacon as a solo player might seem pointless, considering you have no teammates to bring back, although it does provide chances to take down opponents trying to do that very same thing. Whether another lone wolf or duo, this is can be precisely the right time to rain down hellfire. The same can be said for Balloons, when a quick exit is needed. Details go a long way. Is a door open? Has loot already been claimed? Can you spot crates of fallen characters? If any of these apply, contemplate falling back or entering from a less obvious point. Remember if someone blocks a door, you have the option to knock it open with a melee or even blow it to smithereens via explosives.